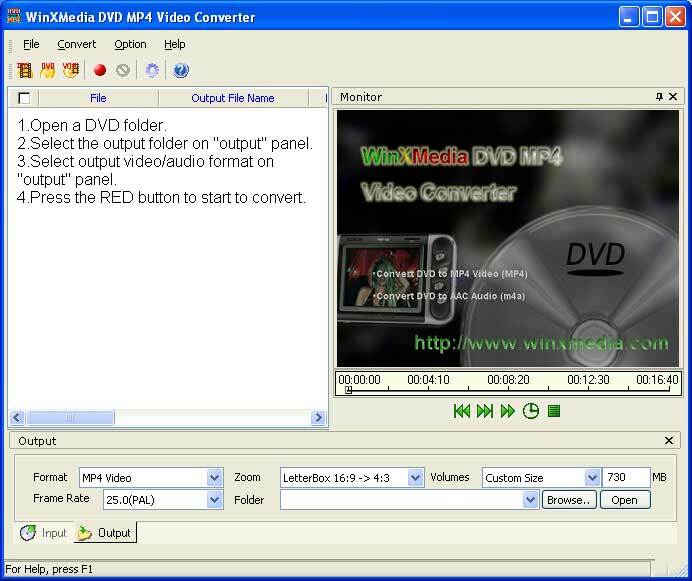 this DVD MP4 Video Converter is an easy to use DVD to MP4 video AAC audio converter. It can produce high quality MP4 video and AAC audio files,Split large files to multi-volumes according to the mode and size you set. Preview video and monitor the converting process. can process DVD, IFO, and MPG/VOB files. provide luminance filter and deinterlace filter. can select a part of video/audio to convert according to start time and quantity of frames. ...... Provide luminance filter and deinterlace filter. Provide the capability for you to set the resolution of the output video and many other advanced options. Easy-to-use user interface. * Can select a part of video/audio to convert according to start time and quantity of frames. * Provide luminace filter and deinterlace filter. * You can select audio track and subtitle to convert. * Provide the capability for you to set the resolution of the output video and many other options. Convert DVD to PSP MP4 AAC video to play on your PSP. Convert DVD to 3GPP 3GP2 MP4 AAC H263 AMR_NB video to play on your mobile phone. Qweas is providing links to WinXMedia DVD MP4 Video Converter 3.25 as a courtesy, and makes no representations regarding WinXMedia DVD MP4 Video Converter or any other applications or any information related thereto. Any questions, complaints or claims regarding this application WinXMedia DVD MP4 Video Converter 3.25 must be directed to the appropriate software vendor. You may click the publisher link of WinXMedia DVD MP4 Video Converter on the top of this page to get more details about the vendor.